Mennonite Church British Columbia. <em>New 'n Notes</em> (Oct/Nov/Dec-2009). Harms, Kelly. "First United Spanish Mennonite Church (Vancouver, British Columbia, Canada)." Global Anabaptist Mennonite Encyclopedia Online. February 2016. Web. 25 Apr 2019. http://gameo.org/index.php?title=First_United_Spanish_Mennonite_Church_(Vancouver,_British_Columbia,_Canada)&oldid=140056. Harms, Kelly. (February 2016). First United Spanish Mennonite Church (Vancouver, British Columbia, Canada). Global Anabaptist Mennonite Encyclopedia Online. 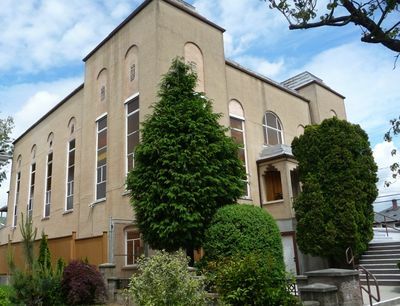 Retrieved 25 April 2019, from http://gameo.org/index.php?title=First_United_Spanish_Mennonite_Church_(Vancouver,_British_Columbia,_Canada)&oldid=140056.